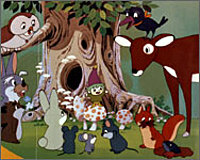 Plot Summary: Peter the Root Fairy and the animals of Placid Forest attempt to force humans out of their forest to keep them from cutting down the trees. At first they stage a peaceful protest, but the humans do not listen. With no other choice, the animals carry out an operation to hinder and annoy the humans.